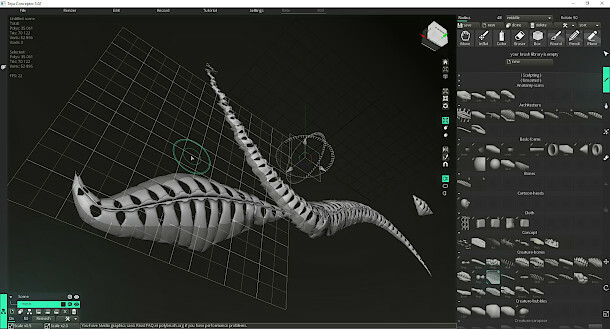 Animator and tools developer Arseniy Korablev has released version 3 of concept sculpting tool Polybrush in free open beta, renaming the product Teya Conceptor. The update overhauls the software’s UI and workflow, providing what Korablev describes as a “simple, handy and modern” user interface. First released in 2016, Polybrush is intended to enable concept artists to create 3D geometry more quickly and intuitively than conventional sculpting packages. Users can sketch out forms by creating strokes in 3D space, using brush presets designed to mimic organic or mechanical parts. The resulting geometry can then be modified using more conventional modelling tools. Once complete, models can be remeshed and exported to other software in OBJ format. Teya Conceptor features a “completely new interface”, replacing Polybrush’s previously rather cluttered UI with a “simple, handy and modern” design. Tools palettes are now launched from tabs on the left-hand side of the UI, saving a lot of screen space, and the viewport gets an Autodesk-style navigation cube. Users can also set the main mouse and keyboard shortcuts to match the defaults in other DCC applications, including 3ds Max, Blender, Cinema 4D, Maya, Modo and ZBrush. The teaser video also mentions “better tools which are always at hand”, but there doesn’t currently seem to be a more detailed changelog on the product website. However, the software is currently available in open beta – you can either get it free, or make a voluntary donation – so you can just download it and explore for yourself. Teya Conceptor is available in open beta for Windows only. To get it free, you’ll need to enter a figure of $0 in Arseniy Korablev’s Gumroad store, then follow the instructions in the text file you download. The software is also available to pre-order, which currently costs $25 for a one-year licence, or $150 for a lifetime licence. According to Korblev, old Polybrush licences will continue to work once Teya Conceptor is released commercially: at the time of posting, there is no official release date.